You gotta love the tag line on the Henry Rifle web site: "Made in America or not made at all". 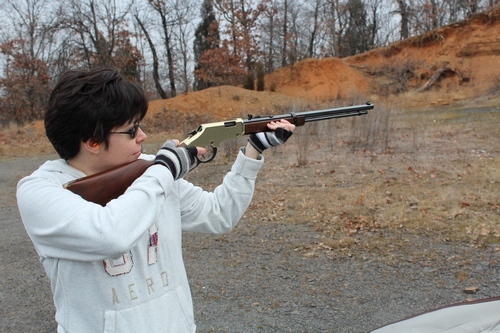 That pride is indicative of the whole philosophy of the Henry rifle company. 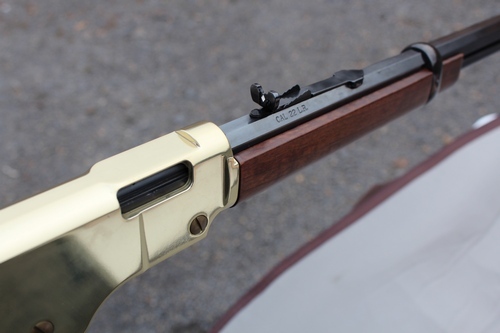 The Henry lever action 22 reviewed here is the Golden Boy edition. And if you're experienced with guns, particularly .22s, you know when you pick this one up, it's not your standard .22 rifle. The gun has become a regular sight at our shooting group, and the owner is Rachel, shown proudly and protectively cocking it below. No matter how many times we've offered to buy it or tried to get her to donate it, or ..... whatever; she won't give it up. But she does share it and let the rest of us shoot it during our range time. The first thing you notice about this Henry .22 rifle is the heft. It doesn't "feel" like a .22. It feels like a much higher caliber rifle. But a .22 it is. A good deal of the quality feel of the rifle comes from the exceptional quality of the build along with the heavy octagonal barrel. It's a barrel that's not going to "flex" when shot. Consequently, the gun is capable of staggering accuracy with the open sights provided. 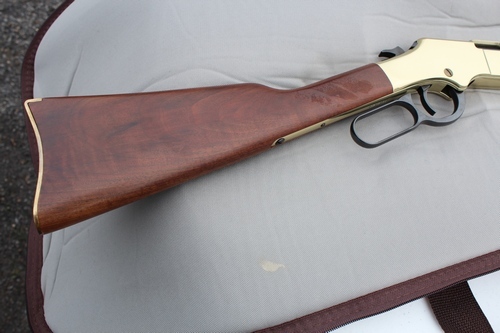 The Henry Golden Boy .22 lever action rifle has a tube magazine that holds 16 rounds of .22 LR ammo. The western cocking action dependably extracts and loads each round. And the balance of the rifle along with adjustable rear sight and thick barrel leaves little up to the shooter except proper gun control. There's not much you can legitimately blame this rifle for if you don't hit the target. Rachel commonly, without a rifle rest, picks off small targets such as potatoes that satisfyingly splatter dozens of feed in every direction. Looking over every inch of this rifle you quickly get the sense of quality from the barrel crown to the stock. With rich walnut stocks, brass buttplate, brasslite receiver and blued barrel, it's about as good looking a production rifle as you'll find. 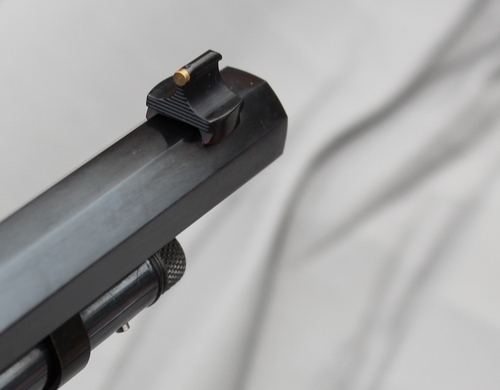 The adjustable buckhorn rear sight, and brass bead front sight round out all the rifle needs to be what it is. The specifications of the Henry Golden Boy Lever Action .22 rifle are: Action: lever action, repeating; Caliber .22; Capacity 16 rds; Total Length: 38.5"; Barrel Length: 20"; Weight 6.75 lbs; Stock: American Walnut; Sites: adjustable buckhorn rear, bead front; Receiver and buttplate: brass. This is a rifle that is elegant in styling, tough in components, and precise in assembly. It is an exceptional production rifle that performs as you would expect from a company like Henry. There's no accounting for cheap .22 ammo, but this gun reviewed has performed with a remarkable level of dependability even with the lowest cost plinking ammo. The Henry Golden Boy or any Henry rifle of any caliber would be a gun you could be proud to own or give as a prized gift. 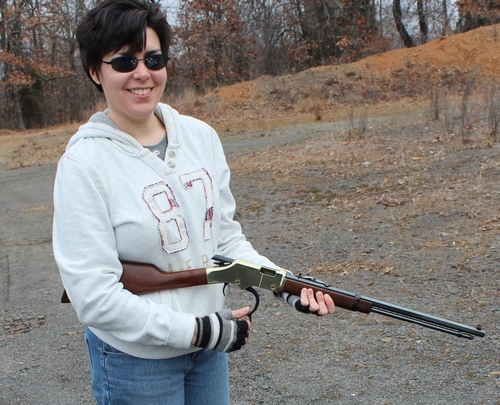 Henry makes several calibers of lever action rifle, but their .22s are their claim to fame. This rifle is evidence as to why. I own two .22 rifles, one bolt action, one semi auto. I could buy a third one in either brand and model and the cost of the three of them would not equal the cost of a Henry lever action .22. But there's a reason for that and its in the long term quality, build and components of the Henry. Bottom line: This gun is everything a high quality production firearm should be. The performance and accuracy are what should be expected. And the firearms of Henry have proven long term durability and dependability. The gun is worth every cent you'll pay for it and it's something you can pass on to your kids and grandkids.